NetSupport Manager is a cross-platform commercial application that was developed by NetSupport Limited. Initially, it used as a Remote Administration Tool for admins to access clients' computers remotely. However, just like many other RATs, this application can also be misused by bad actors to gain illegal access to victims' machines. NetSupport Manager would allow hackers to remotely control the affected device, i.e., install additional malware, harvest banking details or account credentials, gain access to the camera, take screenshots, and much more. The malicious version of the app is being spread with the help of fake updates, such as Flash Player, Chrome or Firefox. Risk factors Loss of valuable information, other malware infection, identity theft, data loss, etc. Additionally, some versions are found being distributed with the help of the infamous HoeflerText Pop-up scam, which was also involved in GandCrab ransomware campaigns. In this article, we will explain how to remove NetSupport Manager virus safely and how to avoid consequences related to the infection. In the detailed research study by FireEye experts, it was reported that NetSupport Manager malware is mostly infecting users from the USA, Netherlands, and Germany, although other countries might be affected as well. The remote server responds with a download of another JS file – Update.js, which will download and execute the final payload. The malware then utilizes PowerShell commands to download a password-protected 7zip file, which contains a NetSupport Manager. Additionally, the malware also creates a NetSupport client on the system for the remote access feature to be available. In addition to establishing NetSupport Manager RAT, the malicious payload also modifies Windows registry, disables Windows Error Reporting function, adds an exception in the firewall, and hides a variety of files on the system. Unfortunately, but the latter means that system files are infected as well, so even after NetSupport Manager removal, the OS might experience a variety of malfunctions. For that reason, we suggest you download and install Reimage to recover from malware infection. Be aware that NetSupport Manager virus might not let you terminate it due to the interference with security software. In such a case, enter Safe Mode and then thoroughly scan your device using reputable security software, such as Malwarebytes MalwarebytesCombo Cleaner or Plumbytes Anti-MalwareMalwarebytes Malwarebytes. Fake updates are among one of the most prominent malware delivery methods used in the wild. Adobe Flash Player updates are one of those which you should be especially worried about, as this outdated plugin is not only known to have a variety of security flaws, but is also used by criminals to initiate fake updates. Therefore, you should always make sure that the update prompt is legitimate. To avoid any type of confusion, experts recommend setting automatic mode for updates. Alternatively, downloading new patches from the official websites only is a good idea as well. In general, do not trust any update prompts that come from your browser on various sites (always check the URL bar – you will most likely see some dodgy domain name). To improve the overall security of your device, you should keep the security application running at all times, apply system updates, avoid spam email attachments or links, and most certainly stay away from software cracks or keygens. 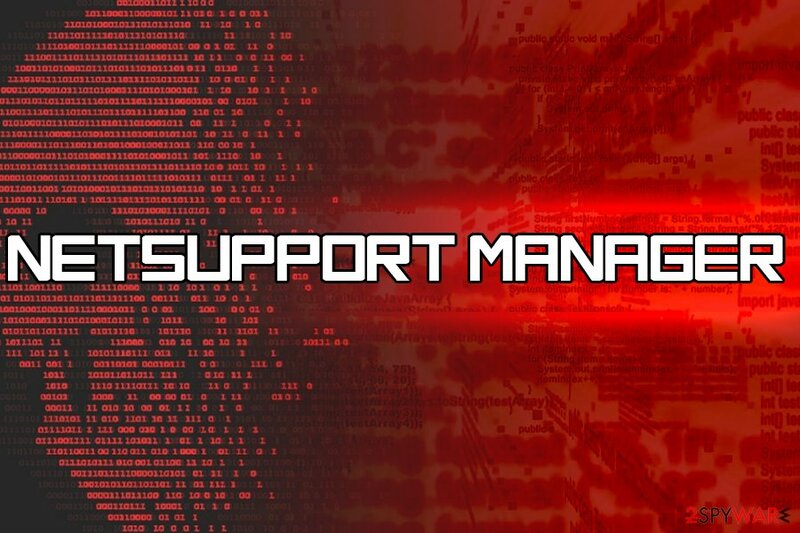 You should even attempt manual NetSupport Manager removal, as the malicious payload performs a variety of changes within the system, and only trained IT professionals can revert the damages without any automated tools. Such a task should always be left for anti-malware applications that are specifically designed to detect and terminate parasites like NetSupport Manager. If you do not have a security application installed yet, download Malwarebytes MalwarebytesCombo Cleaner, Plumbytes Anti-MalwareMalwarebytes Malwarebytes, or another tool (be aware that AV vendors use different databases for malware detection, so not all engines might be able to detect the threat). Before you remove NetSupport Manager virus, you should access the Safe Mode environment which would temporarily stop the malicious tasks from running. After that, you should make sure you reset and change passwords on all your accounts, as hackers might be able to access it due to stolen data from your PC. Log in to your infected account and start the browser. Download Reimage or other legitimate anti-spyware program. Update it before a full system scan and remove malicious files that belong to your ransomware and complete NetSupport Manager removal. When a new window shows up, click Next and select your restore point that is prior the infiltration of NetSupport Manager. After doing that, click Next. Once you restore your system to a previous date, download and scan your computer with Reimage and make sure that NetSupport Manager removal is performed successfully. ^ Jake Doevan. How to remove Remote Administration Tools. 2-spyware. Cybersecurity news and articles. ^ Sudhanshu Dubey. Fake Software Update Abuses NetSupport Remote Access Tool. FireEye. Cyber Security Experts & Solution Providers. ^ Margaret Rouse. Command-and-control server (C&C server). WhatIs.com. IT website. ^ Flash Player : Security Vulnerabilities. CVE Details. The ultimate security vulnerability database. This entry was posted on 2019-04-11 at 06:16 and is filed under Remote Administration Tools, Viruses. You can quickly scan the QR code with your mobile device and have NetSupport Manager manual removal instructions right in your pocket. How did you remove NetSupport Manager?